I don’t have a clear memory of my first visit to the Memorial to the Warsaw Ghetto Uprising as an undergraduate in the summer of 2005, or in 2007 when I returned, this time facilitating the experience for another group of undergraduates. What I do remember about these first trips to Poland was that, even though I was learning to experience the relationship between history and place in a new, embodied way as a study abroad student in Berlin, the feeling and presence of so many waves of often traumatic history in Warsaw was overwhelming. In Berlin it had taken me a few months to get used to the surprise of unwittingly crossing the brass and brick markers inlaid in the pavement that showed where the Berlin wall had wound through the city. The shock of crossing the brass markers labeled “Mur Getta, Ghetto Wall” running through Warsaw’s pavement was something different, and these weeklong visits were certainly not enough time to come to any kind of understanding of what it meant to step across that historical border, with the Soviet-era Palace of Science and Culture rising in one direction and the 50-year old reconstruction of the Old Town spreading out in another. 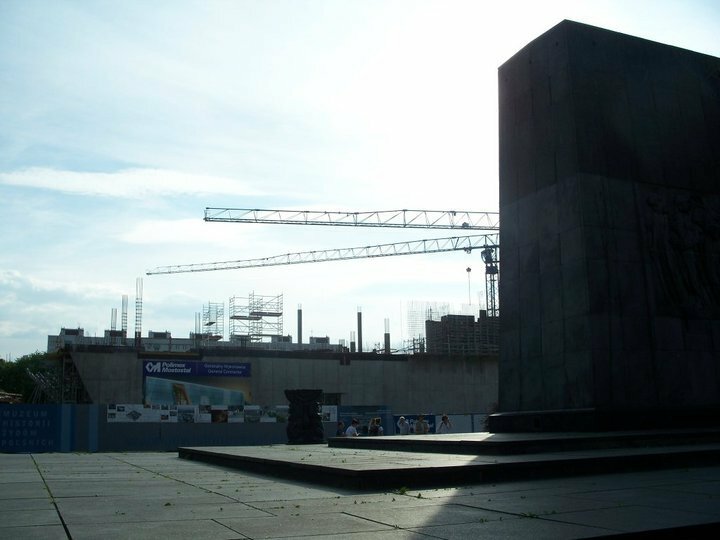 I do remember my visit to the Monument to the Ghetto Heroes in 2010, now as graduate student, because the formerly empty lot behind the monument had become a massive construction site for the Museum of the History of Polish Jews (today POLIN Museum of the History of Polish Jews). It turns out that my previous visits were also important dates in the history of this historical museum: 2005 was the year it was officially established, and in the summer of 2007 (maybe a month after my visit), the foundation stone was laid. In 2012 the museum snuck up on me again when I was traveling with the Helix Project in Sejny, in the northeasternmost corner of Poland, right at the border with Lithuania and Belarus. There in the Vayse Shul of Sejny, we happened upon an international group of teenagers—Poles, Lithuanians, Belarusians, Americans—painting what would become the ceiling of the wooden shul now prominently rising through the floor of the main hall of POLIN Museum as the centerpiece of the Core Exhibition. In 2014 I thought I would finally see the completed project, but I was a few months early for the grand opening of the Core Exhibition and had to settle for a glimpse of the interior. So it wasn’t until this summer, as a GEOP Fellow, that I finally saw the fruition of this massive historical and cultural project that had been unfolding for as long as (and truthfully much longer than) my own story of learning about the history of Polish Jews. Warsaw has changed a great deal in the thirteen years since the museum’s establishment and my first visits, as has the nation around it. That is part of what I continue to find overwhelming about the presence of history here, especially for those of us interested in Warsaw’s history as one of the capitals of Yiddishland. Even compared with Berlin—another capital where it’s hard for a historian to keep up with the pace of change—every decade sees the skyline, the politics, the economy, the technology, and the culture of Warsaw in a state of continual transformation. And the relationship between Warsaw’s present and its Jewish history is one effective bellwether for watching this transformation unfold. 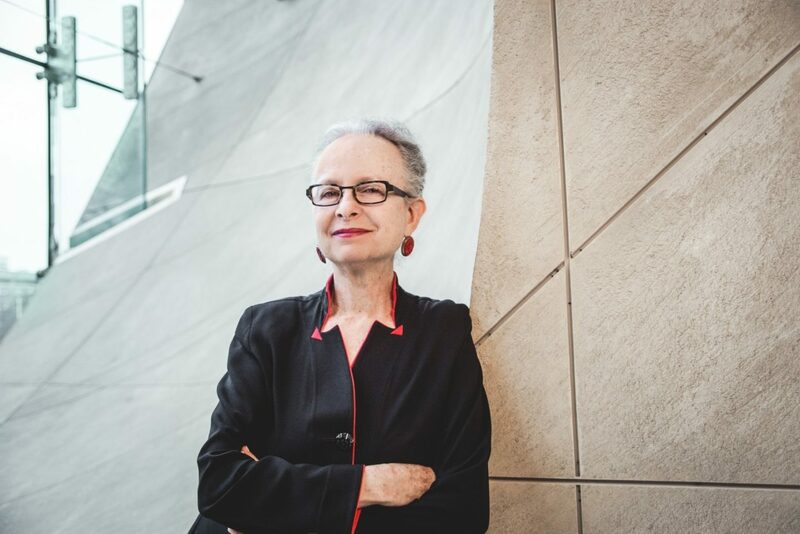 In the following interview, Professor Barbara Kirshenblatt-Gimblett, Chief Curator of the Core Exhibition, spoke with me about the museum’s trajectory from idea to reality, about the role and presence of Yiddish in the museum, including the museum’s unique Yiddish audio guide, and about the effect of contemporary Polish politics on the museum—as well as the museum’s effect on Polish politics in return. POLIN Museum under construction in 2010, with the monument to the Warsaw Ghetto Uprising in the foreground, photo by the author. Madeleine Cohen: Can we start with you describing the role that you’ve played in the development of the museum and the Core Exhibition? Barbara Kirshenblatt-Gimblett: Around 2000, I heard “They are creating a museum of the history of Polish Jews in Warsaw – just one sentence, nothing more. I thought to myself, this doesn’t sound real. And then in 2002, I got a phone call from the director of the project, Jerzy Halbersztadt, who has played a critical role in the development of the museum. I really think that he deserves credit for the vision of the museum that you see today. He said he would be in New York and would like to meet and show me the project. Michael Steinlauf from Gratz College, a close colleague of Jerzy, who had been working with him for many years on this and on other projects, said to him, “You should talk to Barbara.” Michael and I have also known each other for years. He knew that I’m the child of Polish Jews, my parents were born and raised in Poland, my area of expertise is Eastern European Jewish culture and Yiddish studies, and I have a long history of working with museums as a curator and as a scholar, I have been teaching theory and history of museums too. My speciality in the museum field is the history of exhibiting Jews and curating exhibitions on Jewish topics. So, all in all, that is a very unusual combination. Jerzy and I met at the Polish consulate in New York and he showed me the project on a laptop, and I thought, “Oh my God, here it is.” This is a real project, such an important and exciting project. Shortly after that visit, Jerzy called me again and invited me to Warsaw for a week. I reviewed all their materials, the Outline of the Historical Program and the Masterplan for the Core Exhibition, and wrote a report. We had wonderful rapport and I think on the strength of that we stayed in touch and continued consulting informally. We would meet at the Association of Jewish Studies annual conference, where we organized a panel devoted to the future museum, or at expert meetings he would organize at Hebrew Union College and Tel Aviv University. I say “informally” because between 1993, when the idea for the museum arose, and 2005, when the museum was founded, there was no museum.There was only a project to create a museum. The Jewish NGO, the Association of the Jewish Historical Institute of Poland (founded in Warsaw in 1951), had initiated the project and was carrying it. There was no building, but the city of Warsaw had allocated space in front of the Monument to the Ghetto Heroes, if by some miracle the museum would be built. So, the Association knew where it would be, but they didn’t have a building, they didn’t have a collection, and they didn’t have any money. But they were determined—only people who are unbelievably idealistic and so incredibly unrealistic would ever have dreamed of such a project and seen it through successfully. It’s really miraculous. So ultimately, the Association of the Jewish Historical Institute of Poland raised enough money to do three things in preparation for establishing the museum as an institution. First of all, Jerzy, together with Michael Steinlauf and a team of historians in Poland, created an Outline of the Historical Program, which is over 120 pages. Second, they created a database of everything and anything that could conceivably be of use in developing the exhibition, no matter where in the world it might be found. Third, they contracted Event Communications, an exhibition design company in London specializing in multimedia exhibitions – Jeshajahu (Shayke) Weinberg, the visionary behind Beit Hatfutsot in Tel Aviv and first director of the United States Holocaust Memorial Museum in Washington, DC, was convinced that the thousand-year history of Polish Jews was best presented in a multimedia narrative exhibition, exactly the kind of exhibition that he had so successfully pioneered. 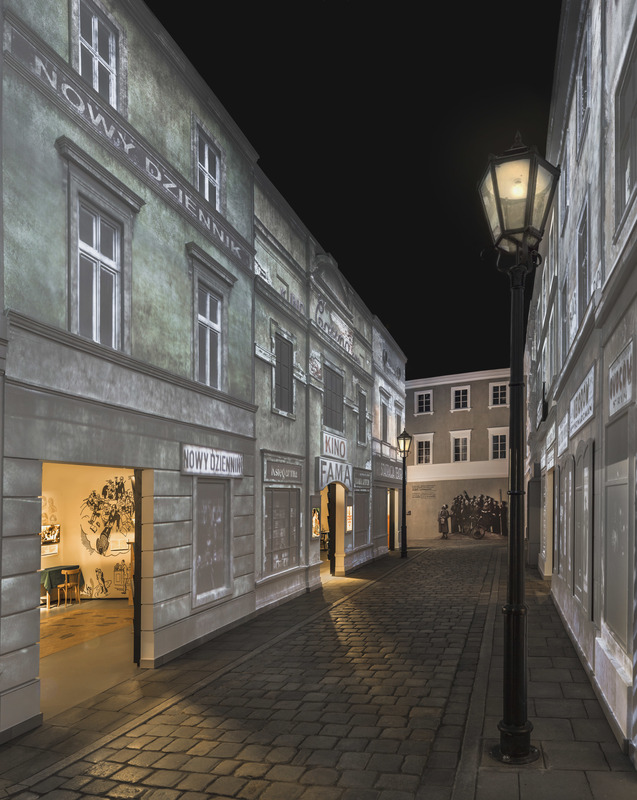 Jerzy handed Event Communications the Outline of the Historical Program and the database and asked them to produce a masterplan for an exhibition that would convey the thousand-year history of Polish Jews in as compelling a way as possible. Imagine the designers creating a masterplan for an exhibition without knowing what the building would be. Astonishing. But the beauty of this situation is that this museum was created from the inside out. That meant that when it came time in 2005 to actually found the museum, the Association took the Masterplan to the Ministry of Culture and National Heritage and the City of Warsaw and said, join with us and let’s make this museum. The 2005 signing of a founding document to create the museum resulted in a unique public-private partnership, indeed a first of its kind for a major cultural institution in Poland. It was at that point, in 2005, that the Association of the Jewish Historical Institute of Poland organized an international architectural competition for the building. They included the Masterplan for the exhibition in the brief to the architects and specified that the building would need to provide an appropriate space for the Core Exhibition. The winner, Rainer Mahlamäki, a Finnish architect, gave us the whole footprint of the building, one big open space, and we could do anything with it. At the beginning of 2006, the time had come to take the Masterplan to the next stage. It was at this point that Jerzy asked me to lead the development of the Core Exhibition, and I began in that capacity in April 2006. We formed a distinguished academic team – international, with scholars from the United States, Israel, and Poland, and multidisciplinary, including not only historians, but also a sociologist, social psychologist, literary scholar, and anthropologist. We supported the scholars with a curatorial team of mostly young Polish scholars, mostly art historians, with some from cultural studies and history – some 12 years later they’re not so young anymore, they’ve got kids, some completed their PhDs, and some are now curators in their own right. It’s wonderful to see how that’s happened. MAC: It seems like such an interesting contrast to the Jewish Museum in Berlin, the Holocaust Museum in Berlin, which opened just a few years earlier, in 2001. With the Libeskind building in Berlin you get the feeling that the building design was the starting point, or is really the main focus, compared to what you’re describing of starting from developing the content that you want the museum to present and then finding the building that fits that. BKG: Right. You know it’s interesting that you refer to the museum in Berlin as a Holocaust museum. MAC: Right, it’s not supposed to be a Holocaust Museum. BKG: That’s one of their problems. The Holocaust was foremost in Libeskind’s thinking, which is reflected in the architecture he created. But they are the Jewish Museum Berlin and they are telling the 2,000 year history of German Jews – to be precise, Jews in the territory that became Germany, as there is evidence from the Roman period of Jewish presence, but virtually nothing between the Roman and medieval period. No one knows why the record goes completely blank. But, basically I agree with you, I happen to love the architecture myself – a lot of people don’t like it, but I think it’s brilliant. However, it’s not well-suited to their permanent exhibition and the story they want to tell. POLIN Museum was a coherent project from the start, perhaps because it started from nothing – nothing, that is, except the story. In contrast, the Jewish Museum Berlin evolved from two Jewish rooms in the Berlin City Museum to the voids in the Libeskind extension of that museum – Jewish presence within the history of Berlin was to be represented iconically as Jewish absence. Eventually, the Berlin City Museum merged with the Berlin City Museum in former East Berlin, at which point the entire complex – the old building and the Libeskind extension – became the Jewish Museum Berlin. Certain misalignments resulted from that process, the most consequential being the Holocaust coding of the architecture. MAC: And it is such powerful architecture that it’s Holocaust orientation is the lingering impression of the entire museum. BKG: It absolutely is. You know, before we opened, there were people who referred to POLIN Museum as the Holocaust museum, perhaps because we are located on the site of the Warsaw ghetto and prewar Jewish neighborhood, facing the Monument to the Ghetto Heroes, but more likely because they assume that the Holocaust is such a defining event that it is difficult to imagine any other kind of museum. Keep in mind that the Jewish Museum Berlin created their permanent exhibition in a very short period of time, something like 14 months, and they didn’t have the time to design it in a way that would be more responsive to the building – the building is a real challenge because it so over-determines the messaging inside and out. Their team is currently creating a completely new permanent exhibition. It will be interesting – it will be much more responsive to the architecture, it will be more sophisticated in many ways. They understand their collection better, they understand their building better, and they are taking more time to think things through, so I think it’s going to be interesting. MAC: I’ll be very curious to see it. I want to ask more specifically about the role and the presence of Yiddish in POLIN Museum. 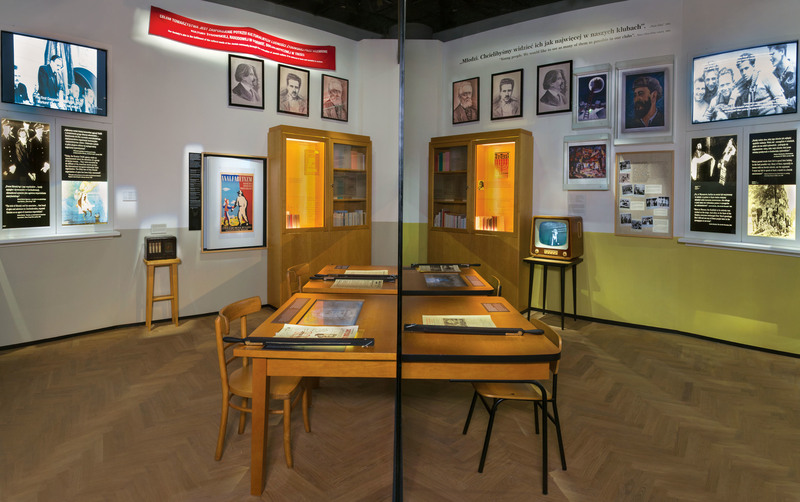 What’s the role of Yiddish in the Core Exhibition and what is the museum aiming to teach or show visitors about Yiddish and its importance to the history of Polish Jewry? BKG: First I’ll say that we had a big discussion about the languages of the exhibition. We all knew that of course it had to be in Polish because we are in Poland, and we all knew it had to be in English because that’s the lingua franca, so that was clear. I explained that there are two ways to deal with these issues. One is to hardwire the solution into the exhibition and to have four languages on the wall. The other is what is called an operational solution, namely to offer guided tours and audio guides in any and all languages. You can support the visit in multiple languages without printing on the wall. The first audio guide that we produced was in Hebrew. Today we have audio guides not only in Hebrew, but also in Polish, English, Russian, Belarusian, Hungarian, German, French, Spanish, and Italian, and live guides in almost as many languages. Not long after there was a proposal to create a Yiddish audio guide – not because of high demand, as you can imagine, but because we thought it was simply important to do. And we did it. We produced a Yiddish audio guide. I listened to about four or five options for Yiddish speakers and chose the one that I thought was very clear and nicely paced, not too slow and not too fast. I had in mind visitors for whom Yiddish is not a first language, probably most of the people using it, and I wanted them to feel very comfortable with it. It had to be easy to listen to. I also encourage our German visitors to take the Yiddish audio guide because I think they’ll understand most of it and find it very interesting. Many of them obviously can read English so it’s not as if they need an audio guide, but a Yiddish audio guide could be an interesting experience for them. Listen to the introduction of the Yiddish audio guide, courtesy POLIN Museum of the History of Polish Jews. We have also created self-guided thematic tours of the exhibition, initially in response to a visitor complaint. Some visitors complained that there wasn’t enough “Judaism.” I assume they expected a section that would answer the question, “What is Judaism?” We did not do that – on principle. So I said, “Let’s find an operational solution. We will create a self-guided tour of the exhibition on the theme of “Jewish Religious Life” – 14 highlights, from the medieval period to the present. “Jewish religious life” and “Judaism” are two different things. Jewish religious life is an integral part of Jewish life, especially before the modern period, which is why this aspect is present throughout the exhibition – it is pervasive, with aspects of Jewish religious life highlighted at various points along the visitor’s path. For those who complain that there is not enough “Judaism,” the pervasive approach to Jewish religious life does not meet their expectations – they may not sense the pervasiveness or notice where aspects of Jewish religious life are brought forward or know where to look. They may experience our incremental approach as a failure to aggregate the various highlights into one dedicated presentation of “Judaism.” One critic proposed that we dispense with the entrance experience, a poetic forest, and replace it with a 10-minute “Judaism pill.” Some visitors expected to see what they know from so many Jewish museums: Jewish ceremonial art organized around the calendar year (Kiddush cups, Hanukkah lamps, seder plates, gragers), the life cycle (circumcision sets, wimpels, ketubot), and synagogue (Torah crown, shield, finials, pointers) – all in one place. Others expressed surprise and relief that we did not follow that pattern. Instead, the self-guided, thematic tour would hopefully address the desire to learn more about Jewish religious life. Want to know about Jewish holidays? Explore our interactive presentation of the Shulḥan Arukh in the early modern gallery, where we present Rabbi Moses Isserles’s notes on differences between Sephardic and Ashkenazi practices, specifically how Jews in Poland do things. This presentation is consistent with our non-normative approach to Jewish religious thought, law, and practice. Several colleagues from abroad expressed pleasant surprise to see the extent to which women appear in the historical narrative. To bring these themes forward, we developed a self-guided thematic tour dedicated to “Jewish Women.” Here too, we do not have a section on Jewish women; they are featured throughout the exhibit. Then I proposed one on the story of Yiddish, from the medieval period to the present. Yiddish is in every gallery, it is everywhere. The beauty of our approach is that we drive the exhibition through quotations from primary sources from the period. Important quotations that carry a key message appear in the original language (not only Polish, Yiddish, and Hebrew, but also Latin, Russian, German, Czech, English, French, Ukrainian, and Belarusian) and in a font that is from the period. The actual fonts, even for Yiddish, are historically accurate: for the interwar years, Haim font, the first modern Hebrew/Yiddish font, a sans-serif Bauhaus-inspired font. As a result, visitors immediately get the message that this territory was historically very diverse – in religion, culture, and language – even if they cannot read all the languages. Returning to your question about how we present Yiddish in the Core Exhibition. First, Yiddish is pervasive, from the medieval period to the present. Second, we present Yiddish in Yiddish and in historically accurate fonts from beginning to end. Third, Yiddish is an integral part of the exhibition, not a separate transhistorical section on something called the Yiddish language. 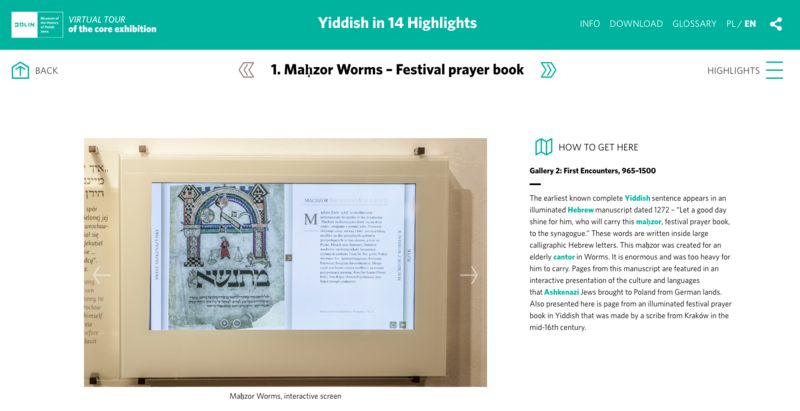 Thus, the Yiddish thematic tour starts with the Mahzor Worms (1272), a beautiful illuminated festival prayer book, which contains the first complete and readable Yiddish sentence. Meynekes Rivke (Rebecca’s Wet Nurse), an ethical guide for women, is the earliest known book written in Yiddish by a woman – the author, Rebecca of Tykocin, died in 1605. Visitors can explore this work at an interactive lectern. We present an original eighteenth-century illustrated edition of the single most popular book in the history of Yiddish printing, the Tsene-rene, also known as the “women’s Bible” – I donated this volume from my personal library. I was deeply moved to hold this book in my hands after POLIN Museum had so beautifully conserved it. Peretz and his circle are a highlight in the nineteenth-century gallery. Vilna as the capital of Yiddishland, with YIVO at its center, and the Yiddish school system are featured in the interwar years gallery. One of my favorite moments is in Tłomackie 13, a space inspired by the place where Warsaw’s writers and artists used to meet. It is here that we present modern Yiddish literary culture. 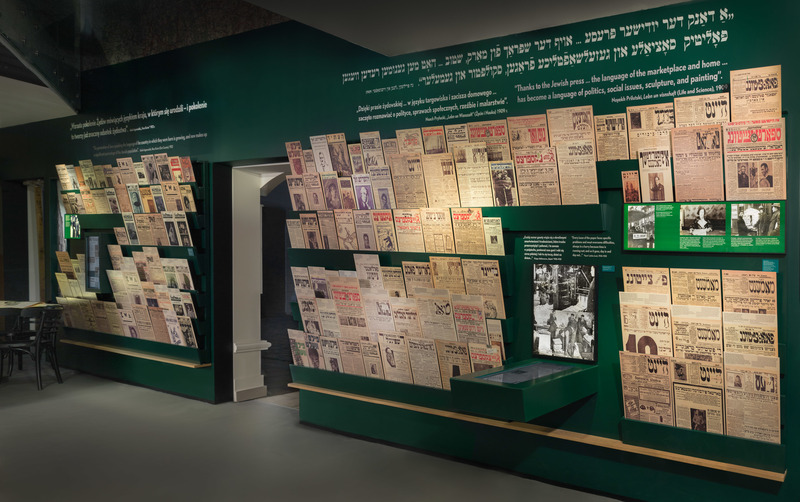 An interactive micrographic presentation of modern Yiddish writers invites the visitor to select a writer, after which an excerpt from one of their works comes up in Yiddish. As the visitor pulls a virtual “magnifier” over the text, a translation into English or Polish appears. Simultaneously, the Yiddish text disintegrates and the floating letters gradually reassemble to form a portrait of the writer. Whereas the writer composed the text, now the text composes the writer. Micrographic portraits of writers and other famous people were popular during the interwar years and in the nineteenth century – on the opening screen of this interactive monitor is a micrographic portrait of Peretz. It is composed of the text of Monish. In a word, there is much more in the exhibition than we could include on the Yiddish thematic tour. Yiddish also appears in the Holocaust gallery: quotations from Emanuel Ringelblum’s diary in Yiddish, as well as excerpts from other diaries, and the song that Diana Blumenfeld sang in the Warsaw Ghetto: “Coolies,” about Jewish rickshaw drivers in the ghetto, set to a prewar “Chinese” tune. We feature a recording of her performance of this song that was made shortly after the war. MAC: I noticed that in the virtual tour one of the stops has an audio sample of kheyder yinglekh learning the alef-beys and the audio wonderfully is in Polish Yiddish, not in klal-shprakh, which was such a nice instance of that attention to specificity that you’re explaining. The children are saying, “kumets alef: u, kumets beys: bu,” instead of “o” and “bo,” I thought that was a lovely level of detail and historical specificity. BKG: Exactly, while this would be good material for a lecture rather than an exhibition, we found ways for visitors to experience Yiddish as a spoken and written language and to get a sense of how internal bilingualism was gendered, how it worked in writing and in speech, and how it worked typographically too. It’s incredibly rich, a great topic for a workshop or a very specialized tour – this is more detail than we could actually present in the exhibition itself, but we were very attentive to ways we could touch on this aspect. Attention to language as such is something that I cared about a lot, and so did Samuel Kassow. Sam and I, and also Michael Steinlauf, were particularly attentive to language and creativity in Jewish languages as well as in co-territorial languages in ways that you’re unlikely to see in other exhibitions. For example, we have a work from the eighteenth century, Kav ha-yashar, a musar work of ethical instruction that first appeared in Hebrew in 1705. It was later printed in Hebrew and Yiddish, but the Yiddish doesn’t include certain passages from the Hebrew text because they were considered too advanced or too esoteric or not appropriate for an unprepared Yiddish reader, generally women but also men who were not proficient in Hebrew. We point out the discrepancy and explain it. So there’s a lot of nuance, and for those who are really interested, it’s there and for those who aren’t, they can move on. 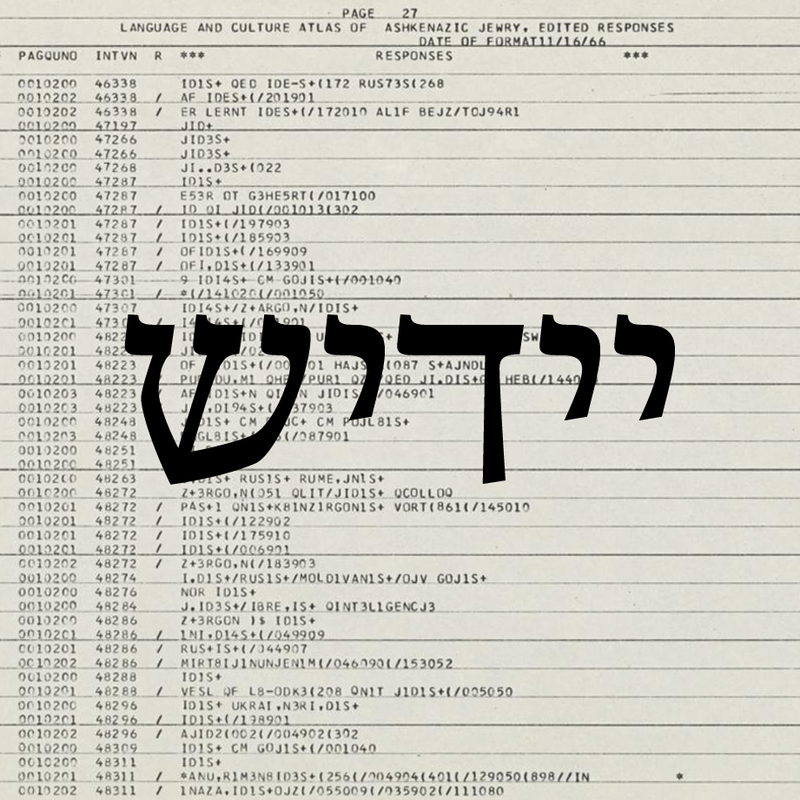 MAC: The virtual tour of Yiddish ends with the publishing house Yidish-bukh in the 1950s. Does the Core Exhibition or does anything else at the museum engage with what people might term the Yiddish Revival since the end of Communism in Poland or with Yiddish in contemporary Polish life? BKG: Not really, but when we have the opportunity to change the final section on the period after 1989, this is something we would want to show. The real heyday of Yiddish in the postwar period was the period of Yidish-bukh, which we present in the section dealing with the 1950’s and 1960’s. This story is set in a TSKŻ (Jewish Social and Cultural Association in Poland) club – we created two interactive “bookcases” as a way of showing what changed after the death of Stalin and the “Thaw.” My favorite moment in the 1950s bookcase is a book of poetry for children by Julian Tuwim. At first glance, judging from the cover and title page, it seems the book is in Polish, and this is the impression my colleagues had. But turn it the other way and the cover, title page, and contents are in Yiddish – Tuvim far kinder (1954) was intended for Jewish schools in Poland and elsewhere. I love the preface: the translator explains to the reader that not everyone, meaning not all Jewish children, can read Polish, the language in which Tuwim wrote. Thanks to this Yiddish translation, they too could now enjoy Tuwim’s beloved poems. By the 1960s, however, young people were not speaking Yiddish and not reading Yiddish. They were oriented to Polish, so, for example, a Jewish newspaper that had addressed youth in Yiddish shifted to Polish. Yiddish gradually faded from use. The March ‘68 anti-Zionist and antisemitic campaign led to the last wave of Jewish emigration from Poland: more than half of the Jews living in Poland left, about 13,000 people, with about 6,000 Jews staying. Many of those who remained were too old or too sick to leave and saw themselves – and were seen by others – as the last Jews of Poland. They are presented in the book Remnants: The Last Jews of Poland, a collection of photographs and conversations by Tomasz Tomaszewski and Małgorzata Niezabitowska. Most of those elderly Jews were Yiddish speakers. The young Jews who stayed did so in large measure because their parents did not want to leave, whether they identified strongly with Polish language and culture or also still had faith that Communism would deliver a better society. Surprisingly, the traumatic events of March ‘68 prompted some of those young Jews, previously indifferent to their Jewish ancestry, to explore what it might mean to be Jewish. They became the seeds of the Jewish renewal, not only in religious but also in cultural terms, including an interest in Hebrew and eventually also in Yiddish. Our presentation of the period after 1989 is minimalist, more minimalist than any of us intended, but for reasons having to do in part with the nature of the space and in part with the pressure of time as we were completing the exhibition. The Yiddish aspect is not there. It could have been if I had thought about it more. Basically, the last section consists of two components. A panoramic projection that presents the renewal of Jewish life and interest of Polish society in all things Jewish and six video monitors – about 20 individuals appear on these monitors responding to a series of questions that we asked: “What does Israel mean to you?” “Is there a future for Jews in Poland?” “Is there antisemitism in Poland?” “Who can make Jewish culture?” “Is Judaism important to you?” And the most interesting question: “Did you always know you were Jewish?” I would never think to ask such a question in Canada or the United States. Of course, we could also have asked “Is Yiddish important to you?”or “Do you think Yiddish is important in the renewal of Jewish life?”, or something along those lines. But in the context of the other questions, asking about Yiddish seemed marginal, to be honest, especially in comparison with questions about Judaism or Israel or a future for Jews in Poland. On reflection, I think it would be an interesting question to ask, especially given the Yiddish focus of the annual Singer Festival in Warsaw and Yiddish language and literature courses at Polish universities. MAC: I’m thinking about the changes in Polish national politics from the time that the museum was first planned and launched, and the partnerships that were established with the Ministry of Culture and National Heritage, to today. Especially in light of things like the recent amendment to the historical laws that would criminalize claims that the Polish state was complicit in the Holocaust. So I’m curious: does the museum have a political role in Poland today, given that Jewish history, at least in terms of WWII and Holocaust history, is still present and to some degree controversial in national politics and in Polish identity? Does the museum have a role to play in those politics in the nation today, or do those politics have an effect on the work of the museum? BKG: First, let me clarify the amendment to the bill that you are asking about. It is misguided and poorly formulated. The amendment doesn’t criminalize statements about Polish violence against Jews during the Second World War. The amendment attempts to criminalize statements that would make the Polish state and the Polish nation co-responsible with Germany for the Holocaust. This amendment does not criminalize statements that individual Poles murdered, or robbed, or raped, or otherwise committed violence against Jews. The goals are to defend the good name of Poland as a nation and as a state and to ensure that Germany’s responsibility for the Holocaust is not diminished and certainly not by making Poland co-responsible for the genocide. Leading up to this amendment, which had come up before without success, has been the campaign to ban the expression “Polish death camps.” As a far as I know, this is only an issue in English, not Polish. And, in English, “Polish death camps” is a shorthand for death camps in Poland, not death camps created by Poles. It would be like saying “Japanese internment camps” in the United States, which does not mean that Japan created them or that Japanese Americans created them. They were internment camps created by Americans on American soil for Americans – Japanese Americans. In the case of Poland, I am assuming that the framers of the amendment are not native English speakers, so when they hear “Polish death camps,” they worry that the phrase implies that Poland created them, which is absolutely not the case – neither historically nor as generally understood. Even during the war, Jan Karski titled an article in Colliers “Polish Death Camp” and referred to “Jewish death camp” in the article – not because Jews created them but because Jews were in them. The anxiety over “Polish death camps” derives at least in part from a lack of sensitivity to the English language. Ironically, before the campaign and before the misbegotten amendment, few people had ever heard the expression. Now, “Polish death camps” is more popular than ever judging by the number of times it turns up as a search term on the Internet. Every time you say, “Don’t say Polish death camps,” you’ve said it! It’s an absolutely hopeless strategy. The President signed the amendment and he sent it to the Constitutional Tribunal to check its constitutionality. The Constitutional Tribunal has advised that Poland can’t prosecute citizens of other countries; it would be not in Poland’s interest to pass a law that it can’t enforce. Meanwhile, the amendment created a diplomatic crisis with Israel and the United States, and huge international outcry. The latest development is a revised amendment, which has been accepted by Israel and the United States – and this too has provoked an outcry from Yad Vashem and such Holocaust authorities as Yehuda Bauer, who declared in Haaretz, “And perhaps it was simply betrayal,” referring to the Israeli government’s acquiescence to Poland’s historical narrative. Such attempts to defend the good name of Poland have backfired. The result is the exact opposite of what was intended. That said, the amendment has even more to do with internal politics, with rallying the supporters of the ruling party, PiS (Prawo i Sprawiedliwość, Law and Justice). It is a way of saying, “You see, the whole world is against us. We have to join together. We, PiS, are the only ones who can defend Poland and its good name.” The approach is authoritarian – coerce through criminalization and legislation. PiS campaigned on the slogans “Down with the pedagogy of shame” and “Up from our knees.” These slogans are shorthand for their polityka historyczna, which translates as “historical policy” and can also be understood as “politics of history.” The implications for cultural institutions, as well as for media and schools, are profound. There are three anniversaries this year, 2018: the 100th anniversary of Poland’s regained independence; the 75th anniversary of the Warsaw ghetto uprising, probably the last round anniversary where Holocaust survivors will be present; and the 50th anniversary of March ‘68. POLIN Museum’s March ‘68 program – Estranged: March ‘68 and Its Aftermath, a temporary exhibition and catalogue, and public programs, including an international conference, lectures, and debates – has become controversial. The exhibition presents the March ‘68 anti-Zionist campaign, which turned out to be an antisemitic campaign. The campaign, which followed the Six-Day War – the Soviet Union sided with the Arabs – had much to do with a power struggle within the Communist apparatus. The result was the last wave of Jewish emigration from Poland. Those who left felt they had no other option because of harassment, being dismissed from their jobs, and feeling humiliated. These were people who had stayed in Poland, who thought of themselves as Polish, and who did not want to leave. They had to give up their Polish citizenship and were given one-way travel documents, which meant they could not return – Poland recently reversed this measure, and they are again recognized as Polish citizens and can get Polish passports. The experience was devastating. They had left behind friends and in some cases also members of their families. Although this was a state-sponsored campaign engineered by the Communist government, the expression of antisemitism also resonated with segments of Polish society. What, then, was so controversial about POLIN Museum’s temporary exhibition? At the very end of the exhibition there is a section on hate speech today that echoes or is almost identical to statements that were made during the March ‘68 period. The examples come from public statements made by politicians, journalists, and public figures in the media. The statements appear in the exhibition without attribution, which focuses attention on the antisemitic nature of the quotations, not the authors. In one case, Magdalena Ogórek, a TV presenter and an unsuccessful candidate for parliament in 2011, as well as a candidate for president in 2015, identified herself as the author of one of the quotations. She was outraged and she demanded an immediate apology from the director of POLIN Museum, Dariusz Stola, and immediate removal of the quotation. The director refused to apologize and refused to remove the quotation, but invited her to come to the museum to see the exhibition and to discuss it with him. She has filed a lawsuit against him, which she has since withdrawn. So what was the quotation? She was attempting to discredit another politician by pointing to his Jewish origins. 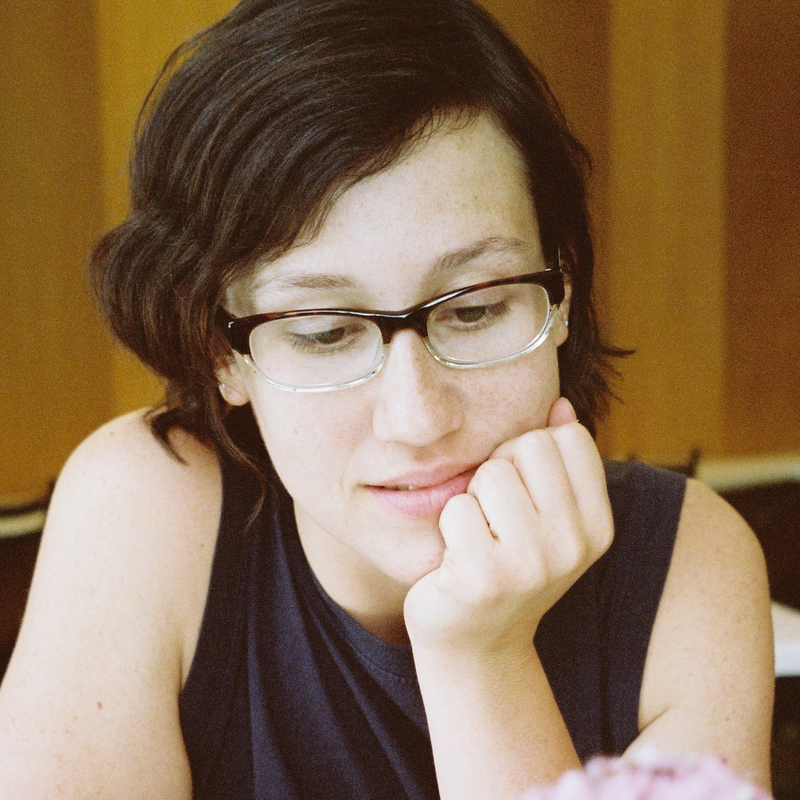 She tweeted, “Why did you change your name from Berman to Borowski?” Actually it was his father who changed the name, not him, but that is irrelevant. What matters is the idea that his Jewish origins, as revealed in the previous family name, would discredit him. We wanted to show that this tactic was used during the March ‘68 antisemitic campaign to identify and expose Jews and then harass them. But, she doesn’t see her tweet as antisemitic. More recently, two senators wrote statements of protest taking the Minister of Culture and National Heritage to task for not exerting complete control over POLIN Museum, its director, the content of its exhibitions, and its public programs – these statements were read aloud in the Polish Parliament. The Minister has responded to such protests with the explanation that his hands are tied because POLIN Museum is a public-private partnership: the partners are the Ministry of Culture and National Heritage, the City of Warsaw, and the Association of the Jewish Historical Institute of Poland. After announcing that he would create a Museum of the Warsaw Ghetto – to tell a story of “the love of two nations” – the Minister received another round of protests. The most revealing one came in the form of a list of questions from Robert Winnicki, a right-wing MP. What kind of museum would this one be? Would it be entirely under the Ministry’s control? Or would it be a public-private partnership like POLIN Museum? 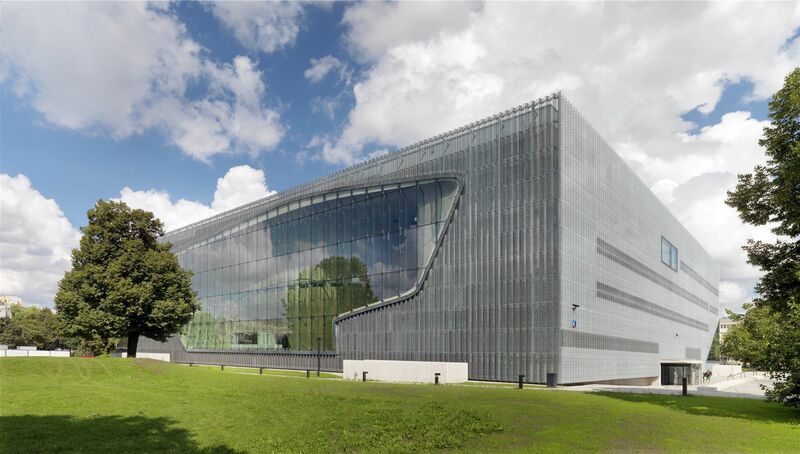 Would it be a “traditional” museum that presents a “neutral” history, or would it be a “modern” museum, like POLIN Museum, where history is a starting point for debate? The Minister himself has declared that museums should promote positive feelings and avoid conflict, which accounts for the proliferation of museums, monuments, and commemorations dedicated to the Polish Righteous and the emphasis on the Righteous in presentations of the Holocaust, whether in textbooks or museums. This view of the role of museums in society stands in strong contrast with the approach in the United States and Germany, among others, today. As a result of the controversies, this exhibition broke all records for an exhibition in Poland on a topic other than art: more than 120,000 people visited the exhibition and attended the public programs accompanying it. As one reviewer declared, POLIN Museum did not have to promote the exhibition. The government did it for them. If I had to put it in a nutshell, I would say this. The key to this museum, the key to any great museum, to any institution of public history is that it be trusted. And to be trusted, it has to have integrity, it has to defend historical accuracy free from political pressure and ideology. It has to stand for independent scientific inquiry and free expression. It must be open to discussion and debate. It has to model what informed and respectful discussion and debate looks like so that different points of view have a place and an opportunity to engage with one another. This is the key, and this is what this museum stands for. Cohen, Madeleine. “Communicating Jewish History in Poland Today.” In geveb, January 2019: https://ingeveb.org/blog/communicating-jewish-history. Cohen, Madeleine. “Communicating Jewish History in Poland Today.” In geveb (January 2019): Accessed Apr 21, 2019.